Our journey started when we flew to Italy from California for our wedding in a medieval castle on a hillside in Florence. It was a magical, whimsical wedding that certainly will never be forgotten. The day after the wedding, we parted ways with guests that had flown in from all over the world for our special day. It was sad, but we were ready for our next adventure. We ventured onto a plane destined for the romantic, yet bustling city of Marrakech, Morocco. We stayed a few nights at amazing romantic candlelit riads that were tucked into the small red-walled alleys of Marrakech. These riads were hidden behind giant fortress-like walls with little doors to hide the noise from the hustle and bustle of the cars and the donkey-pulled wagons. The only sound that could be heard was the chanting on loud speakers around the city for the call for prayer, which occurred five times a day. The early call for prayer that woke us up the following morning was at 5 AM. This, however, was perfect timing for the first day of our Safari Trek. Thanks to Traveler’s Joy, our wedding guests decided they would like to contribute to a long-lasting memory of a honeymoon gift. This unique gift would be purchased by our guests for camel treks into the Sahara Desert and an overnight stay in a Berber tent. It was a costly trek, so having Traveler’s Joy really helped us with the cost of our honeymoon. Our driver showed up and dragged our luggage down the tiny labyrinth alleyways through dirt puddles, red clay walls and kids whipping donkeys. We arrived to a large air-conditioned van and set off out of Marrakech and up towards the Atlas Mountains. We really didn't know what to expect for our journey to the Sahara Desert. I had heard it would be a windy road for a few hours through the mountains to get to the Sahara desert. Little did I know what a long journey that it would turn out to be. As we drove through the winding mountains, sometimes on the edge of cliffs, this is when my first call to prayer came in handy. The mountains were covered with pink flowers and green shrubs. The next mountain would be desert-like and full of yellow sand-colored rocks. It was amazing how diverse the mountains were from one another. On this hot day we would pass women wearing head-to-toe black burkas and walking on remote roads that seemed to be in the middle of nowhere. We would pass by Berber villages made out of red clay and hay. We stopped at one and were invited in by a man dressed head-to-toe in a bright blue kaftgan with gold trimming with a matching turban. He was very kind and invited us onto his roof terrace for mint tea. This tea time lasted two hours because the gentleman actually wanted us to buy his Moroccan carpets. My banker-negotiating husband would not budge on his price nor would this local man. They would say a price then there would be silence then a man would come in and poor more tea. It was like a Chess game with carpets, very slow moving and seeing which move the other would make. Finally, they negotiated a final price and I yelled "Halleluiah!" while taking off the hot Pink Burka they had dressed me in for this hour of negotiating. We then walked out with two carpets. I have to say it seemed a common theme throughout this journey through the high Atlas Mountain villages that the locals enjoyed dressing us up to look like locals. Yet we looked like Berber Barbie and Ken. We took our rolled-up carpets and headed onto a dirt path with our guide to our car and set off for another long journey down the road. Unfortunately, I was a little sick from some raw meat I ate in Italy and had severe pains in my abdomen area. I sat down in the car as it bumped along the rough roads through the mountains and envisioned medical evacuation helicopters picking me up in the middle of the Sahara. I sat up and, in pain, asked the driver, "How much longer?" He replied, "Just four more hours.” I think at that time my eyes rolled back and I fell into a fetal position on the seat and started to pray -- my second calling of prayer. I then remembered I had packed Cipo (the heavy antibacterial fighting medication). I popped a pill and drifted off to sleep with one more prayer that I'd wake up okay before I would have to get on a camel for an hour-and-a-half trek into the desert to sleep in a tent. When I woke to the car stopping, I heard grunts and strange noises outside the car. I peeked my head up to the window and saw countless camels. It was like a used camel parking lot. There were many to choose from. I could have scared a camel from the way my tangled hair looked, so I twisted my turban on my head, took my backpack and my husband grabbed his, and we got on our own camels and set off at sunset for the Sahara. A tiny Berber man who lived in the Sahara was our guide for our camel trek. The people who live in the Sahara in Morocco are called "Berbers.” Our guide for the Sahara adventure was dressed in a bright blue gown and turban. He helped me tie my turban correctly since I had bought five colorful ones to choose from during our stay in the desert. I went with black since it’s always a slimming color. Our camel adventure was a bumpy one – which wasn’t anything new. However, it was a fantastic way to end a long day through the beautiful Atlas Mountains. We rode our camels into the sunset until the palm tree-lined paths turned to sand. It was much smoother in the deeper sand since it slowed down the camels and I could hang on much easier. After about an hour, we arrived at our "honeymoon suite", which was a multicolored dusty and carpeted tent. The tent was situated right up next to a sand dune. You could start at the top and roll down right into the cutout doorway of the tent. We threw our bags on top of one of the carpets inside and lit a lantern to see around the large tent. Just as I was trying to think of some interior design additions that I could make in our tent, I heard our little Berber guide singing outside of the tent and then calling for us. As we peeked out towards the dune, our guide was sitting with his blue Moroccan dress and turban on top of the dune with a beautiful silver ornate teapot and glasses. He said, "Come for Berber whisky and sunset", which really was a Berber mint tea. It was so delicious, especially because of how many cubes of sugar they put into it. We sat in our Moroccan dresses and turbans, drank tea, and then watched the sun set behind our tent with the camels in the background from on top of our sand dune. It was a magical moment. I was feeling much better after the mint tea, but it was getting dark and our Berber said, "I must go now. I will return in one hour with your dinner.” Then he just walked off into the darkness. Meanwhile, my husband and I relaxed in the warm sand and watched the sky get darker and darker and eventually the stars began to reveal themselves. We must have seen twenty shooting stars. I felt like a true Berber now that I was lying in the sand in the Sahara Desert and watching the stars shooting by, all listening to the camels groan off into the distance. I was now a true Berber girl. An hour or more went by and I could hear our Berber guide singing off in the distance, and as he got closer, he got louder. I could hear the rumble of plates and I was starved. He set the tray in the sand and brought out our lantern. My husband and I sat in the sand with a tiny table and ate an amazing meal called a Tangine, which is a vegetable stew. It was very delicious. But even at that point, I was so starved that I would’ve eaten a sheep’s head. After dinner, the Berber guide returned and suggested we follow him. We walked in the darkness, with the only light being the moon and the sparkling stars. It’s quite strange to walk in the darkness over sand dunes, especially because your shoes sink very quickly and fill with the orange sand. I can be quite difficult to get your bearings. All the while, off in the distance we could see a twinkle of light on the ground and it looked like flames. We could hear laughter and some singing. As we got closer, we could see a large fire burning on the sand and about seven Berber men dancing around the fire and banging on the top of buckets. Their voices were beautiful. 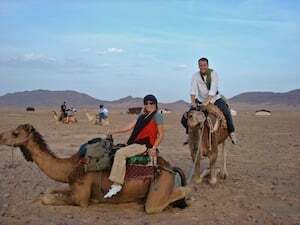 This experience made our trip out in the Sahara so authentic. However, we eventually arrived and I would’ve kissed the ground but I had enough sand in my teeth as it was. We soon got to bed, which consisted of the same floor as you walked in on. We actually dropped down in our clothes and turbans and tried to get some sleep immediately. And when I say, “Tried to get some sleep,” what I mean is, it was so hot in the tent (being that it was made out of camel hair and Berber carpets) that we actually had to strip off most of our clothes in the middle of the night. Then just as we let out a sigh of some heat relief not thirty minutes later did we hear the winds pick up. It was a large howling and blowing of the wind and it was hitting our tent hard. I wanted to peak outside but I was afraid of what the sand would do to my eyes. We were experiencing a true Sahara sandstorm. I thought to myself, this is kind of cool and kind of scary, but I just hope this tent will hold up. Just as I started to sleep to the howling wind, the sheet that covered our tent door blew open and large gusts of sand started blowing in all over us. Imagine having a sweaty body without much clothing on and being covered with very fine sand. Kurt and I sat up half way and just started laughing at the situation we were in. Somewhere between laughs and getting used to our new sandpaper bodies, we drifted off to sleep. A few hours later, I imagine around 4 AM, we woke up not because we were hot or sandy, but because we were freezing. The Sahara is a complicated sandbox where the weather does not play fair. Kurt said out loud, "You've got to be kidding me," and sat up looking for his shirt. "I’m freezing," he said. He tried to dust some of the sand off of his sticky skin, but the sand was too fine to wipe off. He put his clothes over his sandy body and moaned while trying to stay warm. I laughed out loud once again at how funny this situation. Meanwhile, I grabbed for a stack of rough Berber carpets to roll myself in. It was just plain comical at this point. 6 AM came quickly and so did the sun. The sun shined right through the doorway and outlined a little blue body. It was our Berber guide. His blue outfit reflected off of the sun and onto the dune in the background in our dark door way. Our Berber said, "Come now, we must leave before it gets too hot.” I asked where the toilet was, and he laughed and pointed out to the horizon and said, "Choose sand dune.” The Berber guide took Kurt for a walk to get some breakfast down the way and I ventured off into the horizon over a few sand dunes and chose my spot. I was amazed that I really had not gone to the bathroom in 24 hours. I was drinking so much water however my perspiration was beating the amount of water intake. I could hear Kurt yelling my name and looking for me. I yelled, "I'm in the bathroom," and chuckled to myself. After drawing in the sand and taking pictures, I made my way back panting over a sand dune with my turban falling off gasping with a rough voice, "Water…water…I need water.” Kurt didn't find that too amusing and said that our guide was waiting for us with the camels and that we needed to go quickly because of the heat. He knew I was fooling around in the dunes taking self-portraits and thinking of a movie I would film of our little adventure -- which was all true. He knows me and that’s why I married him. We dragged ourselves shuffling our feet to the camels. We were exhausted from not sleeping all night and on top of that super sore. I could barely sit on a satin pillow let alone the hump on a camel’s back. I got onto the camel and it raised itself high off the ground in a shuffle motion as if it wasn't going to make it up with such a heavy load on its back. I was surely offended by this motion and complained that I must have an ancient camel from the Old Testament. I was trying to hold on to two cameras, film and my bag while holding on to the camel – not an easy task. We started off away from our tent and I could tell Kurt was in no mood for my photo shenanigans. He likes his sleep and he did not get much shut-eye the night before. During our hour trek back to a road in the middle of nowhere, I had our Berber stop as I said, "I’m getting off, I just can't take it anymore. My bottom is begging me to give it a rest.” I think I saw Kurt laugh under his heavy green turban as I groaned while my camel shuffled its way back down to the ground to let me off. I’m sure the camel wasn't happy either. As I got off the camel, I thanked the Lord and grabbed my camel’s rope that was held to a mean-looking nose ring on his face. I, too, walked my camel the rest of the way until we reached the palm tree field. We said our farewells, hugged our camels, and I ran to hug our driver. I jumped inside and air-conditioning was blowing. It felt like heaven. It was now another ten hours back for more adventure, shopping in Marrakech souks, getting lost, and more turban purchases in the medinas. It was a fun adventure that we will always cherish. My husband and I laugh now at our trek into the Sahara and think of how amazing that adventure was. Thanks to Traveler’s Joy and the generous gifts of a Sahara Safari from our guests, it will be a memory we will never forget.